There are certain DIY home automation projects that every homeowner would love to tackle. Unfortunately, most DIY persons suffer from a lack of a large enough budget to buy all the neat home automation gadgets that are out there. However, one thing that all DIY people share in common is the ability to think outside of the box. Many DIYer has no problems with taking bits and pieces of other systems, or building from scratch a system that works just as good, if not better than, much more expensive plug and play systems. Here are five interesting DIY home automation projects with links for more information. Home security is usually at the top of every list for the DIYer. Unfortunately, most of the better systems are mostly cost prohibitive for the DIYer on a budget. However, if you are familiar with the Raspberry Pi, then you will want to check out a Rasberry PI CCTV with night vision. From the YouTube channel of Jackktutorials, you will see a step by step, clear and concise instructions and materials links. The idea of voice command anything will always attract the attention of the serious home automation DIYer. Amazon Echo is taking the world by storm what is even better, is you can use Alexa as a platform to build voice command projects for your home automation projects. Here is an easy Particle Photon project that you can build that will allow Alexa to tell you temperature and humidity readings in the house. A swimming pool is a wonderful thing. Being able to relax in or around a pool after a stressful day is a dream that many have. Unfortunately, as any pool owner knows, maintaining a pool can be a real headache. That is where a little DIY know how can create some home automation magic and make a pool a lot less maintenance intensive. 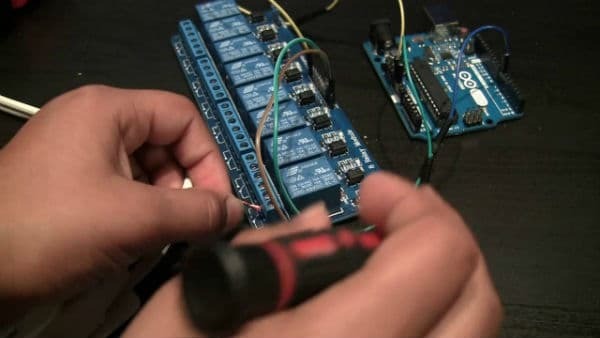 Thanks to a guide on Hackster.io, you can build a relatively inexpensive model that will allow you to control your pumps, heating, and lighting for your pool. For the serious home automation DIYer, Raspberry Pi will be a great companion. Hundreds of uses for it to make your home automation projects easier and more ideas surfacing every day. Many home automation fans love the smart light system by Philips Hue but are not fans of the costs associated with it. Thanks to a how-to guide by Willq44 and Instructables, you can use the Raspberry to turn off and on lights from your smart phone. It may not be as advanced as Hue, but you can always tinker with it to meet your demands. Most true home automation enthusiasts want to automate as many items in their homes as possible. Why should curtains be any exception? Picture DIY projects for you curtains that will open and close them at preset times of the day. It can even be set to play a tune while it does it? The DIY project called Good Morning Sunshine should make for an interesting little side project. If nothing else, it can be one more home automation feature that your home can have to impress your friends. The world of home automation is chugging along slowly. The industry is nowhere near its full potential yet. Lagging demand and high costs are keeping many products out of the reach of the budget conscious home automation fan. Most of all, the true home automation enthusiast knows that a little hard work now on DIY projects will open up lots of free time to tackle other goals and desires later. That is not a real worry for the DIYer, however. With off the shelf technology and a little creative thinking, the home owner can find DIY home automation projects to make any home a fully automated home.